She won her first goldfish! Have you ever wondered why your child’s pet goldfish never lived more than a few weeks or months if you’re lucky? The truth may surprise you. Who doesn’t love goldfish? 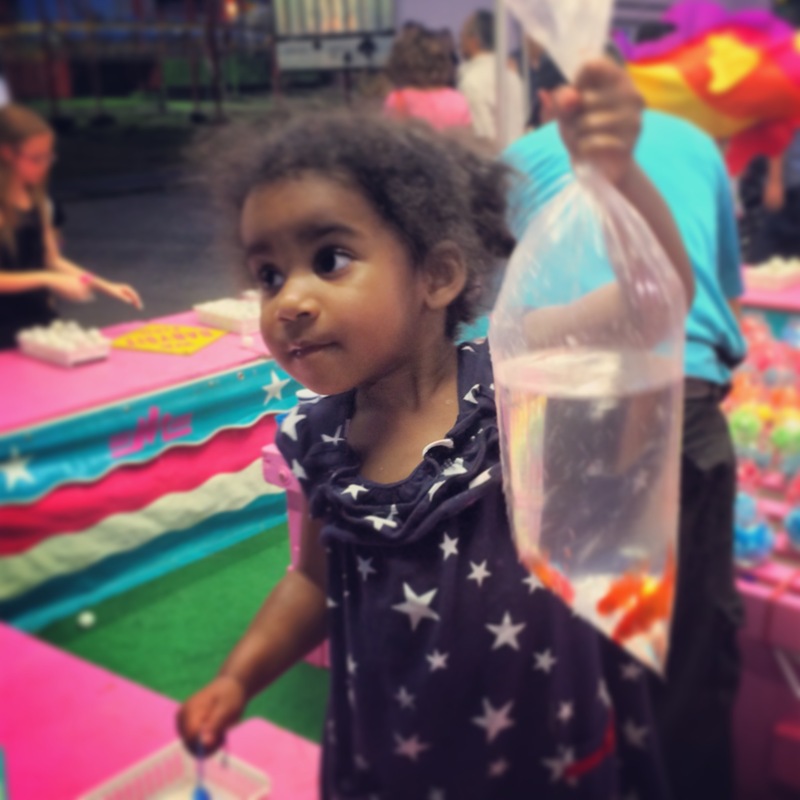 This spring, I took my daughter to her first carnival. Since she’s only two and a half, I knew that the excitement from this evening could make bedtime a breeze for us. I figured we’d eat some ice cream, see the circus animals, and by the time we took our second trip around the carnival festivities, she’d be ready for bed. My plan was on track and my daughter was exhausted as we concluded up our second lap. As I picked her up and started to walk towards the exit, a bright light caught my eye. I walked past a well lit carnival booth that offered the opportunity win a goldfish! Suddenly, I was taken back to a time when I was a young child. I remembered going to the state fair with my parents and begging them for some money to play the same game with the prospect of winning a goldfish. I remember standing there, completely focused on the task at hand – landing my ping pong ball into the fishbowl. I was a winner every summer. In my mind, I felt like it was divine intervention. It was time for my daughter to win her own fish. Since we received twenty ping pong balls for $5, I was confident that she’d come home with at least one fish. We went home with three fish that night. As a child, my fish never lived more than a month or two. Despite my parent’s best efforts to keep the tank clean and the fish fed, I would eventually wake to find one or all of my fish floating upside down in the tank. With these new additions to the family, my wife and I were determined to create an environment that allowed our fish to live as long as possible. After hours of research and talking to some experts in the field, we were shocked to learn that the way most families take care of goldfish borders on pure negligence! They are one of the earliest fish to be domesticated as pets and are the most common fish kept in an aquarium. Goldfish are a domesticated version of the carp that are native to eastern Asia. Carp can grow up up to 30 pounds! During the Tang Dynasty (around 600 AD), it was popular to raise carp in ponds and water gardens. A naturally occurring genetic mutation produced the gold color of the fish. People started to intentionally breed the gold color rather than the normal silver and green colors. On special occasions, families would put their gold fish on display in small glass containers. By the start of the Song Dynasty (1160 AD), the domesticated goldfish we fully established. By 1162 , the empress had ordered the construction of a pond specifically for collecting the red and gold colored fish. By this point in time, those that were outside of the imperial family were forbidden to have goldfish that were the gold color, as it was the imperial color and was protected. Historians believe that this is the reason why there are more of the orange goldfish in existence than any other color. By the 1600’s goldfish were introduced into Japan and quickly made their way to , to Portugal and throughout Europe. In the 1620s, goldfish became highly sought after in most of southern Europe due to their metallic looking scales that symbolized good luck and fortune. It quickly became a tradition for newly married men to give their wife a goldfish as a gift at their one year wedding anniversary. By the mid 1800’s, goldfish were seen as a display of wealth in the United States and are now a fixture in homes of all socioeconomic classes all over the world. But why are my goldfish dying so quickly? 1. Your fish was already half dead when you bought them. Most pet stores consider goldfish a “disposable fish”. They are sold as food for other fish so they only need to stay alive long enough to be taken home and put in for the other fish. They are the “sacrificial” first fish to help cycle a tank. Most of them are bred/raised in such cramped quarters that probably 90 % are dead, dying, or diseased when they get to the pet store. If you are going to buy fish from the pet store, watch the fish carefully for at least 10 minutes. If you win them from a carnival like we did, you can only hope for the best. 2.Your tank is WAY too small. The minimal tank size for one goldfish is THIRTY gallons (Remember, they grow to about 10-12 inches, and sometimes more!) and you will need to add 10 gallons onto that for each additional goldfish. If you get a tank that is too small, the internal organs of the fish will continue to grow and over time, the fish will slowly suffocate. Even though goldfish have been consistently depicted in small bowls, it is part of the reason why with short life spans (ammonia builds up quickly in such a small space). In order to increase your goldfish’s and quality of life, it needs give it a properly sized aquarium. Plan to spend at least $100 dollars for a proper tank and supplies. 3. Where is your filter? This is one the main reasons why most goldfish die so quickly. Although goldfish bowls are very popular, they are far from an ideal environment for goldfish. Goldfish are very easy to care for, but they still require cleaned and well-aerated water, which is hard to maintain in a goldfish bowl. You must change the water in a still fish tank every few days or at least every other week,with a filter. Why? The fish can get ammonia poisoning from the still water, their own waste, and the stress of being so active in an undersized tank. The stress and ammonia poisoning will limit their lung capacity and they’ll pass away. Sad, but true. So far, two of the three goldfish my daughter won are still alive. With proper care, we are hopeful that they will live for many years to come! In closing, I’ll leave you with a fun goldfish fact. Goldfish can grow accustomed to humans and this can make it possible to feed your goldfish by hand? My wife does it all the time. I knew none of this. Wow. We recently bought a beta and keep him in a glass vase that I’m guessing is too small by about 29.5 gallons. This is going to be a good teaching moment about death, isn’t it? i bought 8 gold fishes n 1 black n have placed em in a fish bowl (big) 4 days bck .Today found 2 gold fishes dead. changed d water n cleant it. unable to find out d reason! m worried. Maybe you need a filter? I won ONE goldfish at a carnival and accidentally left it in the car overnight in the freezing cold. Boy did I feel bad! But he survived, so I went out, bought a simple fish bowl, and food. He ended up living for 7 years in that bowl! My son and I actually buried him in the backyard with a little memorial service. Since then we have tried numerous times to keep a goldfish and they have all died within days and/or weeks. I think we just got very lucky with one! try remembering after what activity your fish getting sick and leading to its death.. are you checking ammonia levels… Ofcourse not required if you change water frequently.. if u consider all these points and u can sometimes trace out what’s wrong.. I bought 8 gold fishes n 1 black n have placed em in a fish bowl.with in day 1 gold fish was dead.Again I bought another one after two days 2 gold fishes dead. changed d water n cleant it. I have everything filter.